Everyone I know seems to be addicted to Instagram. I've seen amazing images created by folks who would never call themselves particularly creative. And by people who are, indeed, artists in real life. My instagrams are a mixed bag but I love the square format and retro charm they add to my iPhone snapshots. They remind me of old prints you'd fine in a shoebox tucked away and long forgotten. But how to bring the awesomeness out of the online world and into your living room? Easy: print your Instagrams on ready-to-hang canvas wall art. 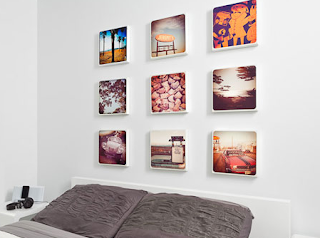 CanvasPop has introduced a service that allows you to print your Instagrams on pre-stretched canvas squares. Right now, you can get these at super low introductory prices: $29.95 for 12" x 12" and $59.95 for 20" x 20" prints with $14 flat-rate shipping to the US and Canada and free shipping on orders over $150. Regular prices are $79 and $114, respectively, so this is really a remarkable deal! Do you have any special ideas for your Instagrams? Let me know. Follow me on Instagram and get $30 off any CanvasPop order of $80 or more with my affiliate link. FYI: CanvasPop is giving away one Instagram canvas print per day! Tag your images #canvaspop and type: "I want this photo printed on canvas with #CanvasPop" to be automatically entered to win! In accordance to the FTC Guidelines and the WOMMA Code of Ethics, I am disclosing that I received no compensation for writing this post. I just thought it was an awesome deal. However, if you click on any of the links and purchase more than $100, I could get some affiliate credit to buy more stuff there. So you know. I really do like the styling of those! So cool!